Samsung Electronics Co., announced today that it has developed the world's largest transmissive TFT LCD (thin-film transistor, liquid crystal display), with sufficiently high resolution to display digital television content. The seven-inch, 640x480 (VGA-standard) flexible display uses a transparent plastic substrate that is thinner, lighter and more durable than the conventional LCD glass panels used today. Moreover, the full-color transmissive LCD panel maintains a constant thickness even when it is bent. Considered the next-generation in flat panel displays, this technology involves the use of pliable plastic instead of rigid glass substrates in TFT-LCD production. The plastic will not break when flexed, allowing much greater freedom in commercial designs requiring flexible full-color, high-resolution display components. 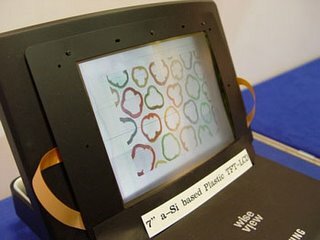 The seven-inch flexible TFT-LCD is optimized for mobility applications, including cell phones and notebook computers. System designers and OEMs also may apply the advanced Samsung display technology to new applications, such as fashion-enhancing or wearable electronic display designs, thanks to its differentiated flexible format. The new display is double the size of Samsung's five-inch flexible LCD display prototype announced in January 2005. With this advancement, Samsung has overcome daunting problems involving the plastic substrate's heat sensitivity including a previous challenge to maintain the display's substrate thickness when subjected to typical commercial thermal conditions. Samsung developed a low-temperature processing technique that can be used to manufacture the display's amorphous thin-film transistors, color filters and liquid crystals at process temperatures much lower than standard glass-based, amorphous silicon (a-Si) technology. Drawing on technology adopted for the production of low-temperature (less than 130 degrees Celsius) a-Si TFT LCD and color filter, Samsung's proprietary LCD technology minimizes substrate deformation by preventing not only changes in thickness but also distortion of images by binding two extremely-thin panels together through a new proprietary system design. The latest flexible LCD panel was developed under a three-year program funded by Samsung Electronics' next-generation display development group under the auspices of the Korean Ministry of Commerce, Industry and Energy, supported by Samsung's Corporate Research Fund. Screen Size (diagonal): 7 inches"